North America Sheet XI North and South Carolina. 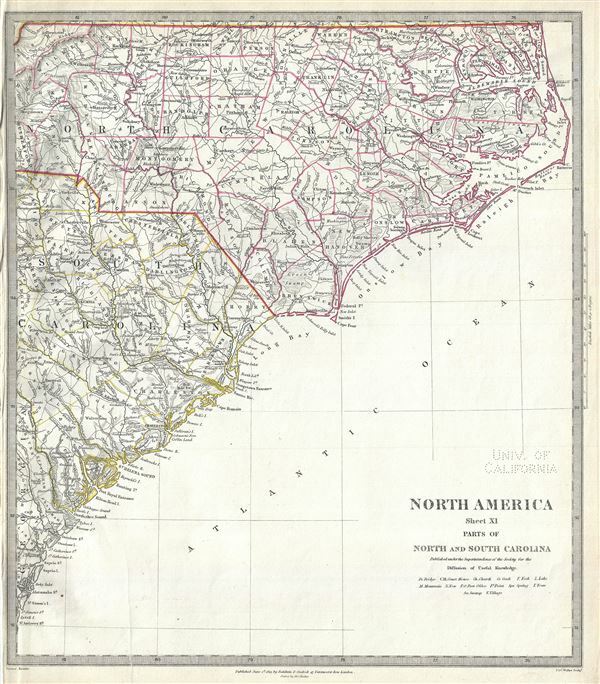 This is a fine 1833 map of North Carolina and South Carolina by the Society for the Diffusion of Useful Knowledge, or S.D.U.K. The map covers part of North and South Carolina from Ashe County in North Carolina to the Atlantic Ocean. It identifies several towns, lakes, mountains and a host of additional topographical features. This map was originally published by Baldwin and Cradock and is copyrighted in 1833, but was issued in Volume two of Chapman and Hall's 1844 edition of Maps of the Society for the Diffusion of Useful Knowledge. It was engraved by John Walker of J. and C. Walker. Rumsey 0890.138. Phillips (Atlases) 794.